Today we are providing you with the complete GK Digest of 2017. It is written in a simple and easy language to learn. The digest is compact, concise and written section-wise for quick revision. 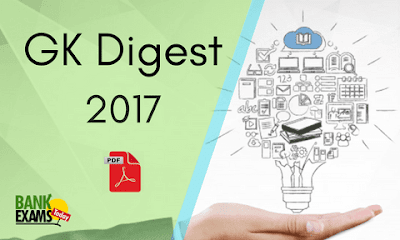 You can read GK Digest 2017 for IBPS, SBI, NICL, RBI or any other competitive exam in India having General Awareness as a section. We are working on separate Banking Awareness Digest. That will be available within 2 days.